Meathead Movers is here to take care of the heavy lifting for you on your move to Patterson. Our clean-cut student athlete movers are ready to get you safely settled into your new home. If you are moving to or from anywhere in Patterson, we are the moving company for you! Our professionally trained student-athlete movers and our moving concierge service are here to help you with every stage of your move. Patterson is a rural small town in beautiful central California. With a focus on agriculture, it is one of the leading producer in apricots, almonds, and walnuts. In fact, the town is known as the Apricot Capitol of the World and yields around 95,000 tons of the fruit each year. After your move, you can unwind with a round of golf at the Diablo Grande golf course with a glass of award-winning Central Valley wine in hand, or take a day trip to nearby Yosemite National Park for extensive hiking and outdoor activities. For health enthusiasts, there are several gyms and fitness centers to choose from and find your perfect workout. 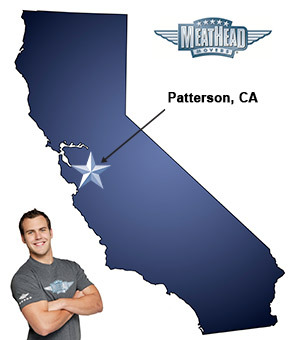 For those looking to move to Patterson, Meathead Movers is the company for you. Our moving company specializes in local, long-distance, and commercial moves to, from, and within Patterson. We also provide reliable packing, storage, on-site relocations, and our distinctive moving concierge service, which connects you with local service providers. All our student-athlete movers are thoroughly screened and trained before their first move. With branches all throughout the state, we are your one-stop resource for all your moving needs, no matter where your California move takes you. Moving to Patterson? Here are some helpful resources.